By Ed ShanahanPublished March 23, 2017 Category Small Regular – No Sugar! Most of our subscribers have likely heard the news that Dunkin’ Chief Financial Officer Paul Carbone will be stepping down from the post next month. 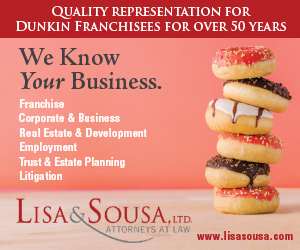 He will be replaced on an interim basis by Kate Jaspon, Dunkin’ Brands Vice President, Finance and Treasurer. Carbone is leaving April 21 to take a position in the retail industry and we wish him the best of luck in his new and future endeavors!